Colt Moore on Catscratch Sister. Seth Petit Photography. 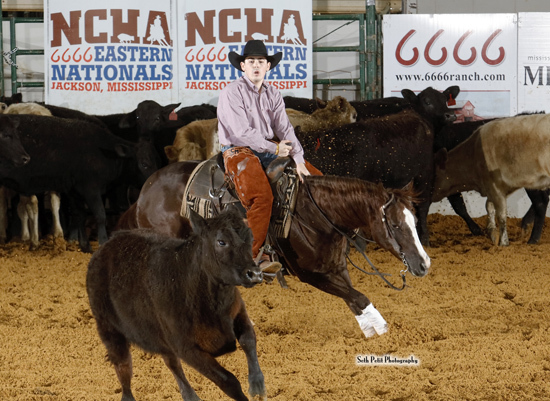 Colt Moore, Williston, Fla., scored 221 points on Catscratch Sister, by WR This Cats Smart, to win the NCHA Eastern Nationals Senior Youth champion title. It was his second championship win in Jackson; in 2015 he rode Highwood Dancer to claim the Eastern Nationals $35,000 Non-Pro title. 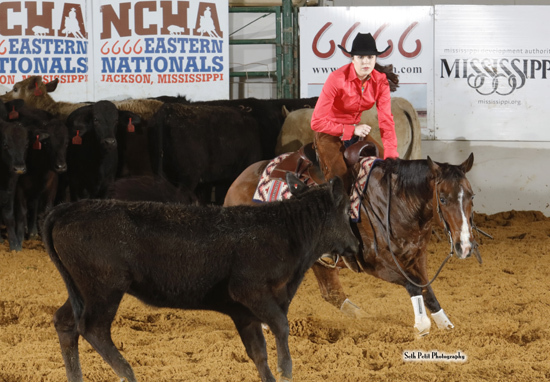 Jaycee Lowery, Gardendale, Ala., the 2012 NCHA LAE Rookie of the Year, was Senior Youth reserve champion with 220.5 points aboard EE Ichi Bar, while Blakley Colgrove, Boligee, Ala., took third with 217 points riding Cat Man Blue. This is the third year Moore, the NCHA earner of $86,794, and 10-year-old Catscratch Sister LTE $131,885, have competed in the Eastern Nationals. In 2017 they placed as finalists in the $5,000 Non-Pro Novice and the $25,000 Non-Pro Novice, and in 2018, they placed third in the $25,000 Novice Non-Pro and seventh in the Senior Youth. With his win, Colt Moore continues a family legacy. His father, Casey Moore, won the NCHA National Finals Senior Youth championship in 1990, before the event was split into the Eastern and Western Nationals. Casey Moore, a trainer with earnings of $900,949, showed Catscratch Sister last year to place fourth in the Eastern Nationals Open. Jaycee Lowery on EE Ichi Bar. Seth Petit Photography. Jaycee Lowery has been successful with 12-year-old EE Ichi Bar LTE 254,772 in limited age and weekend competition. The Cat Ichi gelding carried her as a finalist in the 2013 NCHA Classic Challenge Amateur division, as well as an Eastern Nationals Non-Pro and $15,000 Non-Pro finalist, and as a 2016 Junior Youth finalist. Jaycee is the NCHA earner of $164,375. Blakley Colgrove, the NCHA earner of $668,459, is a many-times limited age event champion. Among other major events, she won the 2014 NCHA Futurity Amateur championship on Paradox Cat, who also carried her as 2015 NCHA Derby Amateur Unlimited champion, and 2017, NCHA Super Stakes Classic Non-Pro champion. Blakley’s Eastern Nationals mount this year, Cat Man Blue LTE $229,203, by High Brow Cat, is owned by Lazy M Cattle LLC, Forney, Tex.